Hoping to catch more of the bream that we did the previous week, we went in with the same game plan. The day was windier and the bream were gone. They seem to like the calmer conditions, most probably due to less disturbance on your line. 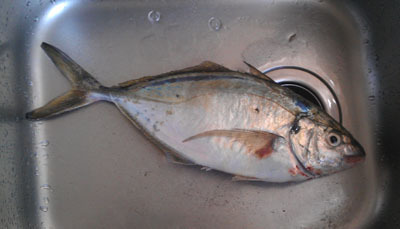 Towards the end of the day, we hooked up on this corker of a trevally at around the 35cm mark! Pound for pound they fight a lot harder than bream, and you can normally tell by the circular motion they make in the water as you are bringing them up.